Meggin Patricia Cabot (born February 1, 1967) is an American author of romantic and paranormal fiction for teens and adults. She has written and published over fifty books, and is best known for The Princess Diaries, later made by Walt Disney Pictures into two feature films of the same name. Meg's books have been the recipients of numerous awards, including the New York Public Library Books for the Teen Age, the American Library Association Quick Pick for Reluctant Readers, the Tennessee Volunteer State TASL Book Award, the Book Sense Pick, the Evergreen Young Adult Book Award, the IRA/CBC Young Adult Choice, and many others. She has had numerous no. 1 New York Times bestsellers. Cabot has more than 25 million copies of her books—children's, young adult, and adult—in print worldwide. 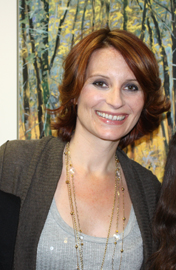 Meg Cabot married financial writer and poet Benjamin D. Egnatz on April 1, 1993. Their wedding date, April Fool's Day, was a deliberate play on her husband's belief that only fools get married in the first place. The wedding was actually an elopement in Italy. Her novel Every Boy's Got One is loosely based on her own elopement. She has cats, Henrietta (a one-eyed cat) (1993-Jan 2013) and Gem, about which she often blogs. Since that time Cabot has published two additional books and an ebook short for tweens featuring Olivia Grace as the protagonist. See the “Olivia Grace Series” below. Cabot has stated on her website that great excitement concerning the series in Hollywood and a strong possibility of it being turned either into a movie or a TV series exist . From the Notebooks of a Middle School Princess is a series for "tween" readers featuring Princess Mia's half-sister, Olivia Grace. The books are illustrated by Meg Cabot. The first book, Insatiable, was released on June 8, 2010, and became an instant New York Times bestseller. This series is a modern retelling of Bram Stoker's Dracula, but the main character, Meena Harper, can foretell people's death. She's being forced by the television show for which she works to write vampires into the plot due to their popularity. Meena, however, hates vampires (she doesn't believe in them, and doesn't like how they always go after and kill girls). This complicates things when she finds out from Alaric Wulf, a demon-hunter with a secret unit of the Vatican called the Palatine Guard, that vampires are attacking girls all over her native New York City, and that her new boyfriend might be one of them: Lucien Antonescu, Dracula's son, the Prince of Darkness. A sequel to Insatiable called Overbite was released on July 5, 2011. An untitled Queen of Babble movie is currently "in development". The book has been optioned by Jeffrey Sharp of Sharp Independent, with Kristen Bell slated to star. There has also been some talk of The Mediator being adapted into a film or television series. ^ a b Princess Diaries I (1) | Author Meg Cabot. Megcabot.com. Retrieved on 2012-12-31. ^ All-American Girl | Author Meg Cabot. Megcabot.com (September 1, 2002). Retrieved on 2012-12-31. ^ a b c Meg Cabot Biography. Notablebiographies.com. Retrieved on 2012-12-31. ^ a b c Historical Romance Writers Author: Patricia Cabot. Historicalromancewriters.com (December 3, 2012). Retrieved on 2012-12-31. ^ "Report from Downton Cabot: Life Goes On - Meg Cabot". Meg Cabot. January 28, 2013. Retrieved September 5, 2017. ^ a b Meg Cabot Biography – Airhead Author – CosmoGIRL! Archived February 27, 2009, at the Wayback Machine. Cosmogirl.com (February 1, 1967). Retrieved on 2012-12-31. ^ Giving Thanks | | Meg CabotMeg Cabot. Megcabot.com (November 24, 2010). Retrieved on 2012-12-31. ^ "Disney Channel & Disney XD Present Programming Plans for 2010–11 – TV Ratings, Nielsen Ratings, Television Show Ratings". TVbytheNumbers.com. March 3, 2010. Archived from the original on March 5, 2010. Retrieved July 11, 2010.